Chief Executive Officer (CEO) of Orange Telecom Sierra Leone, Aminata Kane Ndiaye, has disclosed that her company will construct more fifty communication pole sites across the country. The company already has two hundred and thirty -five poles across the country. Aminata Kane Ndiaye made the disclosure last Thursday, 7th February, during a the launch of a pole site at Yiffin Town, Nieni Chiefdom in the Koinadugu District. She added that in 2018, they constructed thirty-five pole sites in the country. She said the launch of the pole site in the chiefdom was a fulfillment of their plans for this year, and that it was an important milestone in the lives of the Nieni Chiefdom, as they welcome the inhabitants to the Orange Telecom Sierra Leone family. She called on chiefdom authorities to be watchdogs for the facility, and promised that the chiefdom would also benefit from their charity foundation that they would soon be launched. 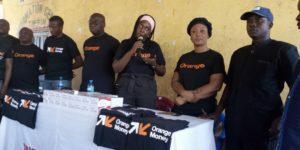 Annie Wonnie, Direct Sales Manager, Nieni Chiefdom, said they have every reason to celebrate because Orange Telecom has connected them with the rest of the world, and that they were also going to benefit a lot from the services of the company including the orange money service. She said Orange’s presence in the chiefdom would boost development, address security, health and other emergencies that would help save lives and promote education. Member of Parliament of Constituency 046, Hon.Daniel Koroma, welcomed Orange and stated that the presence of the company in the chiefdom would help them hear, see and understand communication. He said the orange money service, which was becoming the easiest method of banking, would help indigenes to send monies to their children outside the chiefdom and also receive monies from outside the chiefdom respectively. He called on the company to continue reaching out to more places in the Koinadugu District, thus drawing their attention to the deplorable condition of the road leading to the chiefdom. He assured the company that they would make sure the facility was well protected from any form of harm, adding that they would plant trees round it.